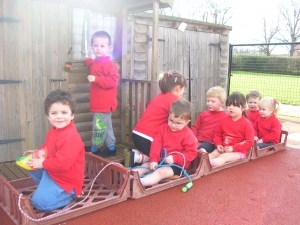 Peasmarsh Flying Start Pre-School provides a safe and fun environment where children socialise, form great friendships and learn through a variety of exciting and imaginative activities. Our friendly and approachable team strive to provide the best possible standard of care and education for each child and we are committed to making sure that those with particular needs are catered for. As well as having a wealth of experience in childcare, our key workers are qualified to NVQ Level 3 in Childcare, are Makaton trained and hold up-to-date paediatric first aid certificates and child protection certificates. Set in idyllic countryside, our Pre-School benefits from modern, purpose-built facilities including a well-equipped, light and airy classroom, beautiful, outdoor all-weather play area, our own vegetable patch and access to wider school facilities including the hall, playing fields, adventure playground and its Forest School area. “Outcomes for children are good... They learn about early maths, enjoy turn-taking activities and are well prepared for their move to school. Children are eager to learn from the wide range of activities provided. Younger children learn new language skills through playing word games and listening to staff. All children enjoy the challenge of the natural area outside as they run, climb and explore.” Ofsted, 2018.